Many people living on the streets know that the only exit from homelessness is finding a home. But in a city with exorbitant rents, that becomes trickier than simply getting a job and submitting an application. Some already work, and others are on a fixed income. And leaving altogether often isn’t a viable alternative. Catherine Mary Kelliher is living under the overpass in an area known as “the Hairball” with some 10 other of the city’s estimated 6,500 to 10,000 homeless. Kelliher was evicted from her apartment near St. Luke’s hospital, where she had lived since 2009, in late 2015. At the time, she had been paying around $1,000 a month to rent a small one-bedroom. The eviction came on the heels of a manic episode Kelliher suffered that she attributed to having been misdiagnosed and prescribed the wrong medication. Now diagnosed as bipolar and medicated appropriately, Kelliher still cannot work, as she is disabled three ways: She has three herniated discs in her neck, bipolar disorder, and Multiple Sclerosis. She is in treatment for all three, but finding a job that pays enough to rent an apartment is laughable. For Kelliher and others, it isn’t as simple as just finding a cheap apartment elsewhere. 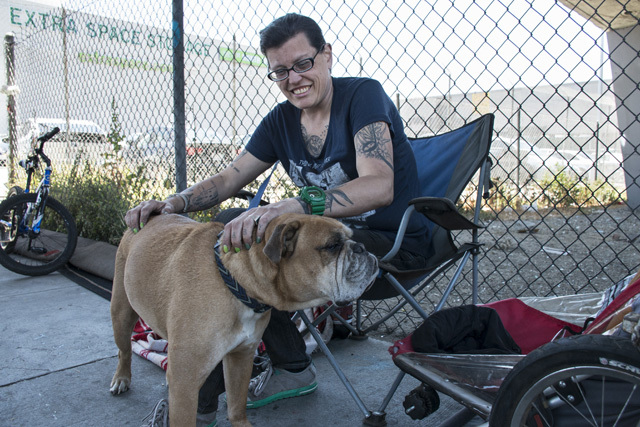 Many of those on San Francisco’s streets suffer from chronic illnesses, Kelliher said. Others are not leaving because they are partway through the process of getting housing, even if their experience to outsiders might seem fruitless. Tita Malcolm, for example, said she has been on the waiting list for affordable housing through the Department of Housing and Urban Development for ten years. A few times she was ready to pick up her key, but was delayed. Most recently, a department worker told her Malcolm would need to keep waiting as a family displaced by a fire had been placed in the unit she was slated to receive. “She goes, well, our obligation goes first to our residents. And I said well, aren’t I a resident, a part of you guys now? Add she said no, our actual residents,” Malcolm recalled. Heroin addiction, evictions from shared apartments, and disagreements with her partner have also hampered Malcolm’s path to permanent residency. But she is determined to get placed. The thought of her son, from whose life she was largely absent but who is now poised to attend the University of California at San Diego on a full scholarship, also keeps her motivated to move forward. Corinthians Redmon’s life started in the Mission, at San Francisco General Hospital, and it feels like home to him. But forget renting an apartment here. “2,000 bucks a month? I can’t do that,” he said. He, too, camps out under the Hairball. His grandmother owned a house directly across from General Hospital, and he spent the first years of his life in the Mission. Eventually, he bought a house with his wife. But the pair split, Redmon lost the house, and his attempts to stay with roommates around the city faltered when his income was insufficient to pay rent. From there he tried hotels, and when those proved untenable also, he reconnected with an uncle who had already been staying under the Hairball for some time, eventually joining him. With no actual evictions under his belt and a bit of money saved, he’s hopeful it wouldn’t be too difficult to sign a lease somewhere, but he’s not sure what would help him get there. When his flower shop on 16th and Geary failed, James Colangelo sold everything he had and bought a tent to stave off going into crippling debt and ruining his credit. Now he lives on the street and does odd jobs where he can get them. He also works for an entertainment company that builds and runs ice rinks in the winter. He helps with setup and works as an EMT. At night he goes home to an encampment. But what’s even harder to find is an affordable place to stay. He’s saving up to rent a place but knows it will take time. What would help him off the street? Those who are tasked with helping the homeless get off the street are familiar with the refrain and know that housing is not easy to come by. Sam Dodge, the Mayor’s current point person on homelessness, agreed that the famous Navigation Center, designed to help transition people from the streets to some kind of place to stay, hinges on the availability of housing. Kelley Cutler, who works with the Coalition on Homelessness, said she knows of nurses, teachers, and other professionals living in the shelter system because rent is unaffordable. “It wasn’t always like this,” she said, citing federal cuts in spending on housing programs. But part of it is also city infrastructure, which Cutler said used to support poor people. With a new influx of younger, wealthier residents, cities as a whole have become more unaffordable, but the infrastructure to support the destitute has not migrated out. This story is published as part of a collaborative project among some 70 Bay Area news organizations to highlight homelessness this week. You can see the full range of coverage here.